Check boxes to specify which languages you wish to use when creating web pages. 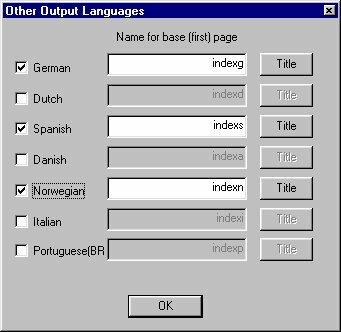 Edit boxes allowing you to specify the base pages name for each language. Title button allowing you to specify the title for each base page. One Check box for each language. 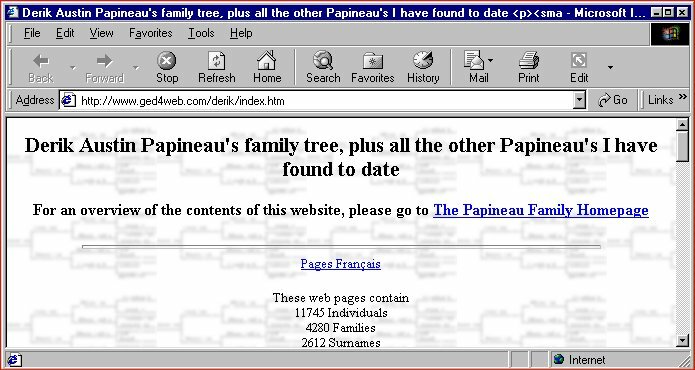 English and French are not on this page, because they are on the main page. If you check the box next to the language (German for example), GED4WEB will create web pages with all words in German. 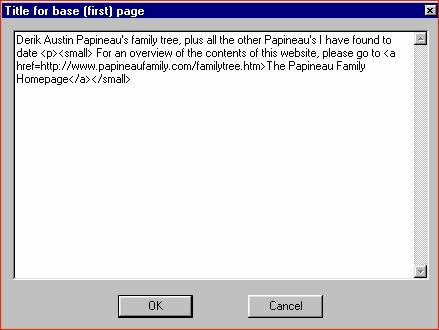 The words read from the GEDCOM file will not be converted. I do not modify the data read from the GEDCOM file and any way. This is where you specify the name of the base (home page). This is defaulted to index.htm. 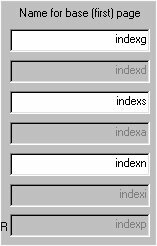 Most websites require that the homepage be named index.htm (or index.html). If the main GED4WEB page, is going to be your website's homepage, then leave it index.htm. If the main GED4WEB page is not going to be your homepage's main page, change it to a different name. Each language must have a different name for the base page, and you can specify the base page name for each or accept the defaults.. Here you can enter any text you would like displayed in both the Title Bar of the web browser and the top of the first (base) page. As you can see from my example, you can also include any HTML formatting text you wish. The results of this example are displayed in the following web page.